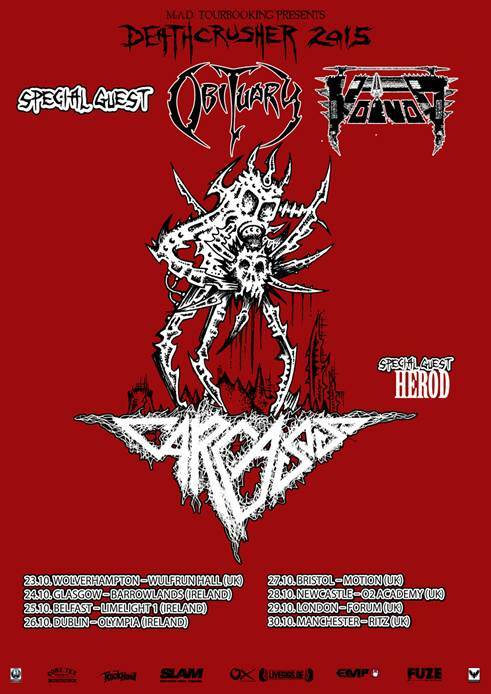 Disinterred British extreme metal legends Carcass are proud to announce that they will be playing the UK leg of the highly anticipated ‘Deathcrusher Tour 2015’ alongside Obituary, Voivod and Herod. This vociferous line-up will be hitting the UK this October. 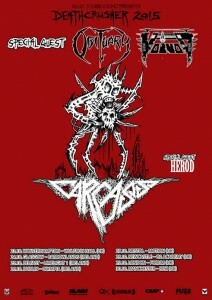 Carcass’ most recent album ‘Surgical Steel’ was released in September 2013 to widespread critical acclaim. It was their first studio release since their 1996 LP ‘Swansong’. The record was produced by Colin Richardson (Napalm Death, Bold Thrower, Gorefest, Cannibal Corpse, Sinister, Rodrigo Y Gabriela) and mixed/mastered by Andy Sneap (Megadeth, Accept, Exodus, Testament).